Posting has been slow for the past week as I have been working on some technical challenges to produce the map tiles for the Okaihau and Opua lines. These have now been overcome and the tiles are now in the GIS for the historical imagery of Okaihau, Otiria, Kawakawa and Moerewa to add to the ones of Kaikohe that I already had but haven't done any work with yet. What I did get done apart from that in the last few days was the map of the Marsden Point corridor. 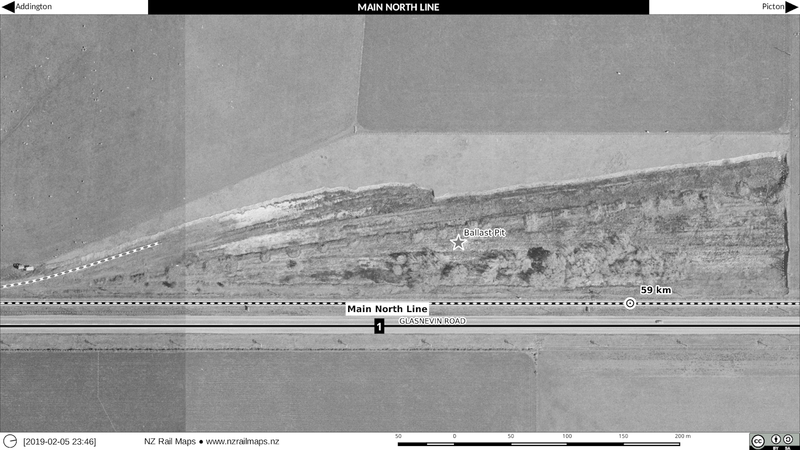 The Marsden Point line has been an idea in one form or another for over 100 years. Back in 1914, the government at that time surveyed a branch line to Waipu, which is a township south of Ruakaka. Construction works were undertaken over the subsequent ten years, but the line never opened. I don't have any information on the route it would have taken; it is possible it could be partly the same as the Marsden Point corridor, but since State Highway 1 is there today, we don't know if any construction works are still visible or have been absorbed into the highway or other roads after such a long time. Anyway it was abandoned. 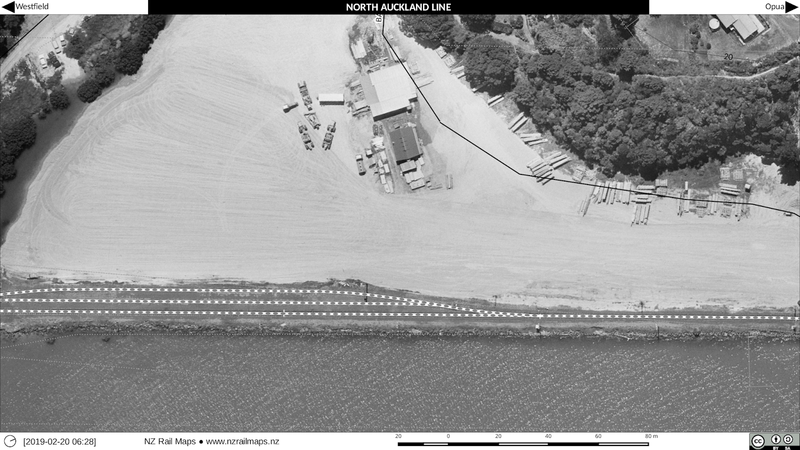 The idea of building a line to Marsden Point itself has existed since the 1970s with the oil refinery for NZ developed there in the early 1960s. Firstly there was an idea to bring coal in to run the Marsden Point power station which had up to then run on oil, because the cost of oil had gone up, and then the development of the port was also considered in 1979, but as the port did not really get up and going at that time, there was still no real justification for a railway to be built. The NZR proposal for the line, produced in 1981, came up with a scheme for building a line which would have needed five rail bridges, two road overbridges and a tunnel. 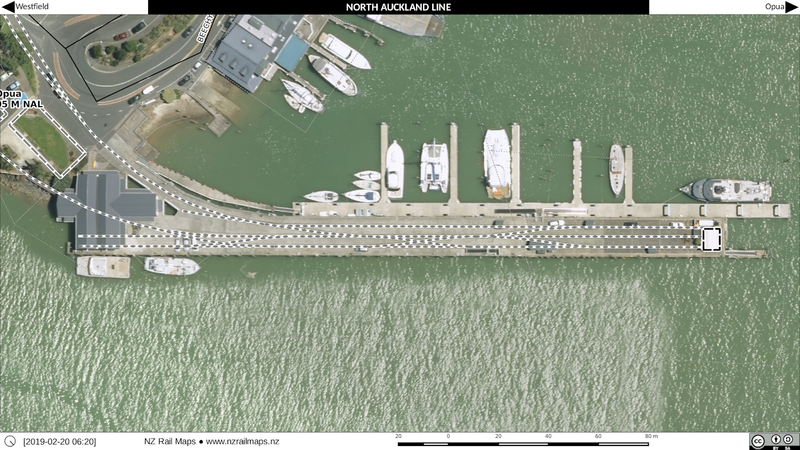 Nothing more was heard of the idea until the early 2000s when Northport (Marsden Point) began to be developed as a replacement for the port of Whangarei. 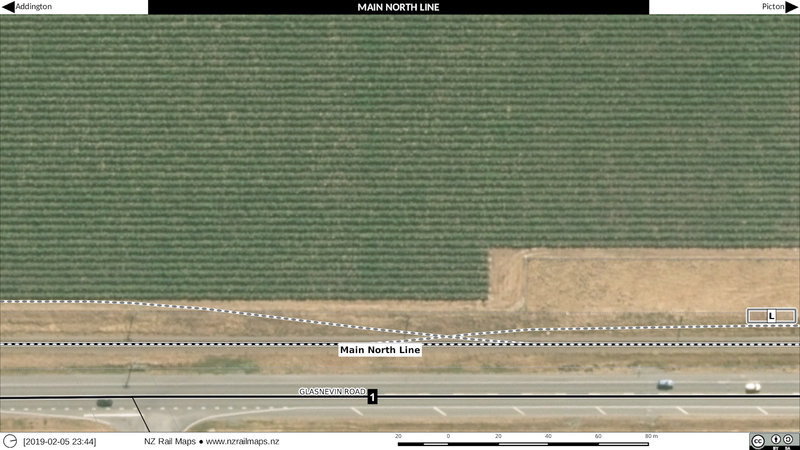 The development of the new port did not include the rail line link. 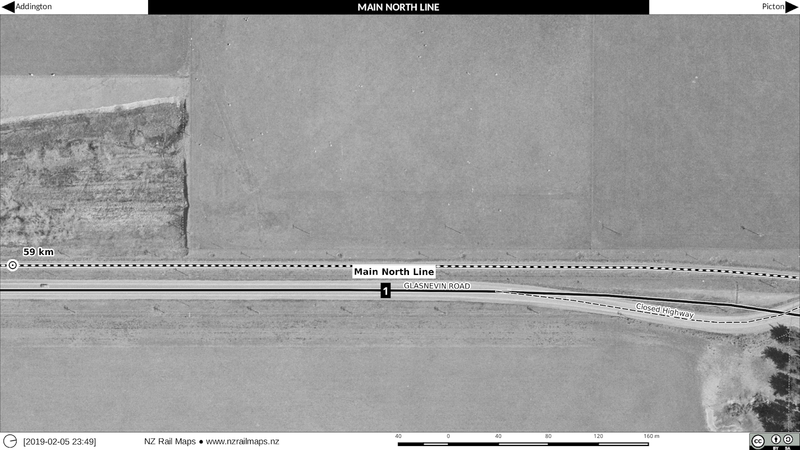 Another feasibility study suggested that a 16 km branch line would be needed at a cost of $87 million. Further work was undertaken between the various parties with ONTRACK to resolve various questions and challenges and get a business case together. 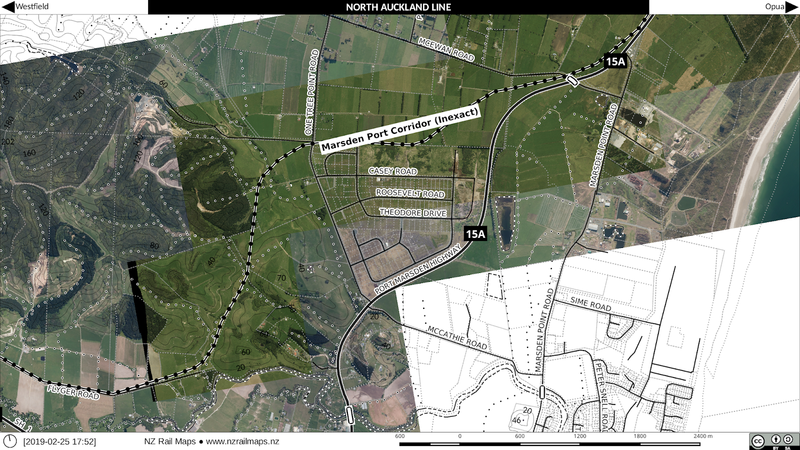 When Port of Whangarei finally closed in 2007 there was still no rail line, but at that time Northland Regional Council was buying up the land needed for the corridor. This was followed by ONTRACK in 2008-9 formally designated the route as a rail corridor. However in late 2008 there was a general election and the pro-rail Labour government was defeated at the elections and replaced by a National Government which immediately put a lot of constraints and limits on rail development in general, and Kiwirail was required to stop a lot of projects they had underway at the time and develop a turnaround plan to make the business profitable. This proved to be impossible to achieve and the government continued to fund Kiwirail's losses, but the rail network around the country was run down during the nine years National was in office, and there was no more work done at that time on the Marsden Point line, whilst other parts of the Northland rail network were reduced or mothballed during that period. 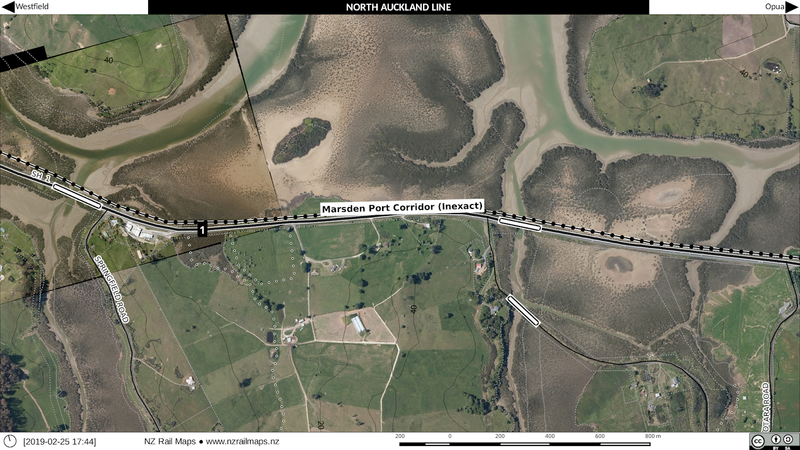 With a change of government in 2017 to a Labour-Green-NZ First coalition, work has been picked up on the Marsden Point route, now expected to cost around $200 million. In addition, funding of $600 million has been provisionally allocated to renovate the rest of the Northland rail network up to 2020, subject to the business cases being developed. Another round of geological testing was completed earlier this month on the Marsden Point corridor whilst the design work and business case are being developed. This will then lead to tenders being called for the work, and if everything goes well we possibly could see the first sod being turned by the end of this year. Because the corridor survey data has yet to be input into the Linz property parcels database, these maps are based on the map released about 10 years ago which only gave a general idea of the corridor location. Likewise the shape of the junction at Oakleigh is a question, it will probably be a triangle but I don't know what curve radius they would use. The curve I have drawn is around 200 metres radius. I can't imagine less than 150 metres radius being used for this curve; that would limit trains to a speed of 45 km/h at the junction, which is probably still quite reasonable, as they may end up being stopped for signalling purposes there anyway. The first four images are Oakleigh station, with the historical image from 1982. Oakleigh was only ever a fairly small station with a dogbox station shelter, goods shed, loop and stockyards siding. None of that exists today except for the dogbox which seems to have survived. So far as the Marsden Point line goes we'll start by looking at the junction. Here I have drawn a curve at about 200 metres radius and it ends up crossing the swamp, which really can't be avoided for a triangle junction, with the amount of swamp in the vicinity of the station. After that we would expect the route to be reasonably close to the highway so as to make construction through the swamp reasonably easy. We continue alongside the highway for the next map. Once we are out of the swamp then the railway can take a straighter route than the highway, which is following a historical alignment that curves around. The land at this point is rolling fields so there is not really much to see at this location. The highway has straightened up and come back in parallel to the rail corridor along this section. The corridor would go south of what looks like a limeworks quarry here. More of the same in this segment. Here we have zoomed out a lot to cover a lot more distance, specifically where the line turns and crosses a hilly section of ground. This is probably where NZR in 1981 thought they should have had a tunnel. The current thinking seems to suggest this will be a cutting instead. 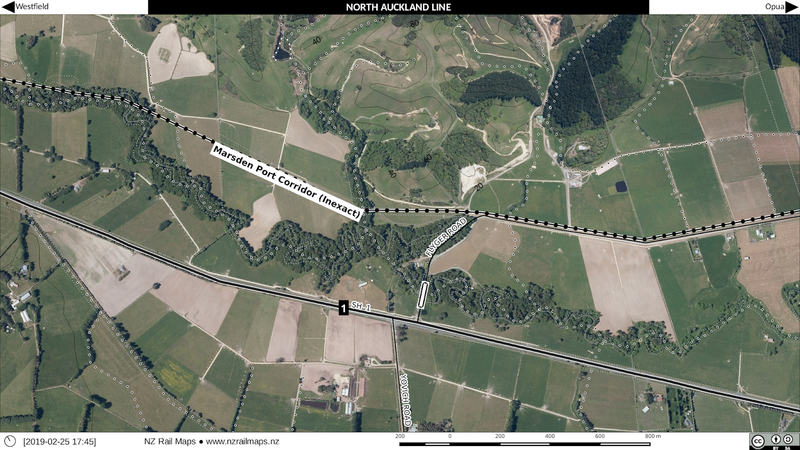 However there are questions over the stability of the hill, and one could assume NZR thought that a tunnel (perhaps built as cut and cover) would have been a better idea to deal with landslips in cutting walls. 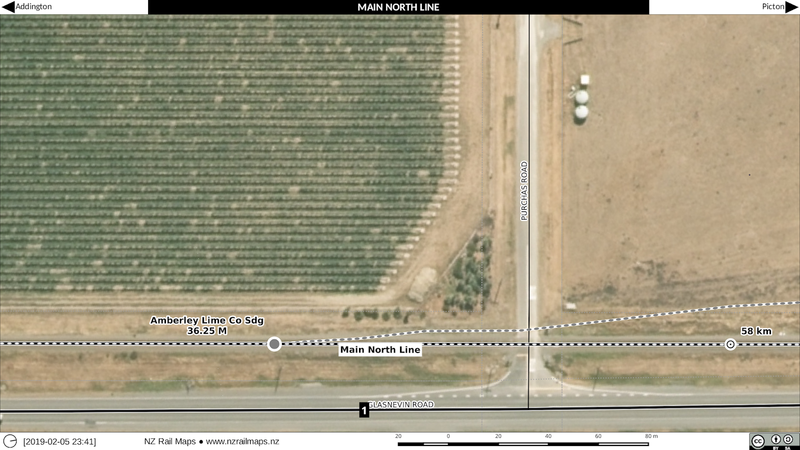 The last piece shows Marsden Point and roughly where the line will finish up, next to State Highway 15A. This highway was built within the last decade and does not appear on the late 2000s map that I copied the rail corridor from. So as I have done the first set of maps for the two lines north of Otiria, here they are. 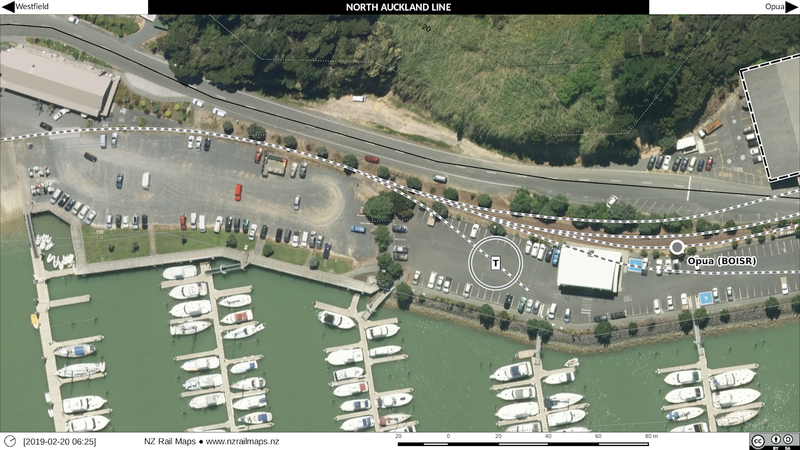 The ones for Opua are relatively easy because the base imagery from Linz is available in 0.1 metre resolution, which is also available for Kaikohe, the next station we will look at, but not for any of the other four stations - Okaihau, Otiria, Kawakawa or Moerewa. At the same time as typing this I am about to extract the sectioned layers for those four stations from a 15 GB mosaic image (the biggest one I have ever worked on, which used 68 GB of memory/swap resource on the computer that was editing it). Anyway here is Opua. All I can really tell you about Opua is that it has changed a lot over the years and I will try to document that but I only have done maps at this stage for the last 44 years. For a historical perspective here is the first Opua station yard which is quite detailed and it is dated 1950. I will eventually be drawing a map of this but that will come later. So you can see there was an engine shed as well as the turntable and the original station building. Opua wharf in 1975. The tracks at that time were still connected up and probably still used to load ships at that time. Opua wharf 2014 much modified for the marina. 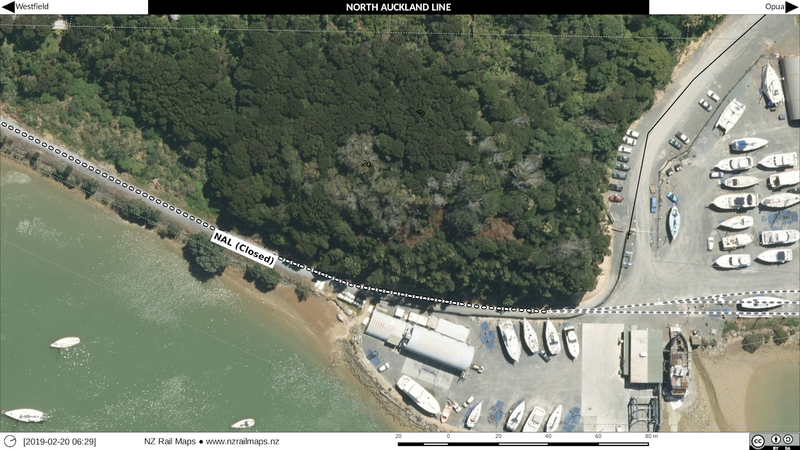 Although track is still in place it is disconnected, and the only ships that come into Opua apart from ferry services, fishing boats and yachts, are mainly cruise ships which anchor offshore and use launches to transfer passengers to shore. Opua main yard area 1975 (second station). The original layout had the railway facilities in against the hill as seen in the first picture. About the late 1960s the yard was completely changed to allow this big shed to be built, which was cut into the hillside, and I am presuming this shed belonged to the local harbour board, which probably also used most of the other unmarked sheds that can be seen. NZR at this time had a small station and goods shed, indicated by the S and G markings. Passenger services to Opua ceased about this time and were probably poorly used by the time this station was built, and there is no sign of a platform of any sort. Loading banks are another common yard feature that aren't obvious in this picture, and the size of the goods shed indicates NZR didn't handle much general freight at this time. Towards the left of this view of Opua (2014) we can see the site of the third Opua station, which is the one that the Bay of Islands Scenic Railway operated from 1985 to 2001. 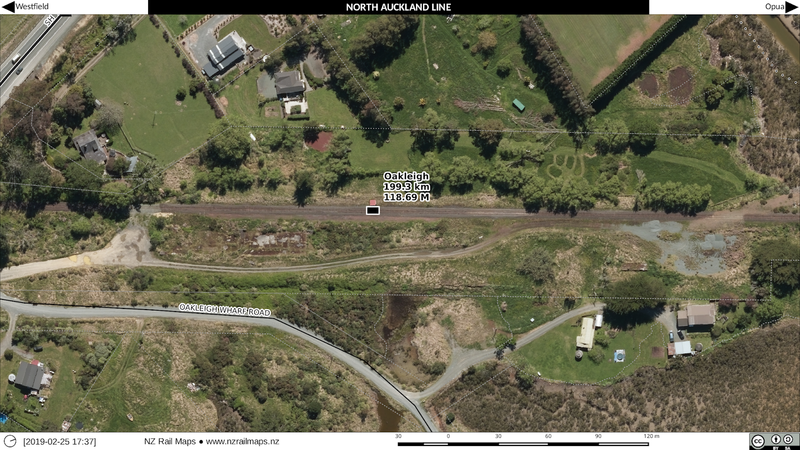 There are naturally questions as to how they chose this site but I would guess there had been changes made at Opua or that were being pushed through which meant they didn't have the ability to use the NZR station site a little further north, or decided this was a better site. In all probability they were already coming under the pressure that began to rear its head in the early 2000s to give up part of the station yard to other interests. Because LTSA forced BOISR to shut down in 2001 for failing to meet their safety obligations, commercial interests at that time moved in and occupied most of the land around the station and when BOIVR got going soon after they were forced out of Opua by the local council pandering to the commercial development interests, mainly boatyards and the marina development that can be seen. The turntable was taken out around 2006 and moved to Kawakawa where it is still used by BOIVR. This photo is from 1985 Whites Aviation and it shows that at that time possibly just before BOISR moved in that the station buildings at Opua appear to have gone and there were some other small buildings put on the station site plus a lot of carparking so evidently squatters had moved into the site by that stage. Probably a boat repair yard judging by the some of the stuff lying around. This appears to have been encouraged wholesale by local authorities in that era. This is a Whites Aviation photo from 1986 looking over Opua from the west and what we can see is a jetty has been built out into the sea that was not even there in 1985 so as soon as NZR moved out the squatters moved in, this is the same everywhere, commercial interests and local councils bullying government agencies for land. So that turn of events would have pretty quickly made sure the use of the second railway yard at Opua would have not been available to any new owner of the Opua railway. To the right of the big storage shed you can see J 1211 with some rolling stock because the Bay of Islands Scenic Railway had taken over the line at that stage and was running J 1211 in the summer of 1985/86 on the line. So their terminus was up by the turntable where by that stage they had built a small platform for the passengers. The black and white 1975 image doesn't show much that hasn't already been covered so I will just refer here to the obvious views, the turntable and most of the area that BOISR was using has all been taken over for a marina as they were bullied out by local commercial interests supported by the local council that took over the Far North District Council.This appears to be before Wayne Brown was first elected as the Mayor (John Carter came along later) but of course decisions are made by a full council which in a district like Far North would be dominated by right wing people. Neither of Brown nor Carter have been particularly friendly to railway development so far with Brown in particular pushing for the Northland Regional Council to be abolished and still ranting against the regional council to this day and Carter calling for a large unitary council as opposed to the smaller FNDC unitary authority that Brown wanted. The only good thing is Brown has now changed his tune and wants the railways in the north to be developed to help his business interests but if NRC had been abolished as he wanted that would have been a big blow to railway development as at that time they were instrumental in getting work started on the Marsden Point corridor. What still remains at Opua is the platform and the tracks just behind it where BOISR used to run into but the platform now has a building that has been put on top of it and whilst the track is still there it isn't accessible by trains any longer. And the turntable pit has been filled in to make a carpark. Again we will consider both photos together. This area of land was actually a causeway for the railway because the bay area was filled in sometime in the 1960s going by the Whites Aviation photos and as seen 1975 it seems at that stage to have been filled in relatively recently at that time. Nowadays it is all boatyard and the problem for BOIVR is that the boatyards took over the rail corridor just as soon as BOISR was closed down and whilst you in fact still can find the railway line going along the route that it used to take it is all being squatted on. Again looking at both photos. This is basically the limit of the 1975 aerial photos (it's possible there may have been more area covered by some of the other photos in the series, but I always choose just the minimum number needed to cover a yard to reduce my workload). And already in 1975 there was a boat yard established on the foreshore and the NZR would have had issues with stuff being dragged across the tracks by boatyard people. 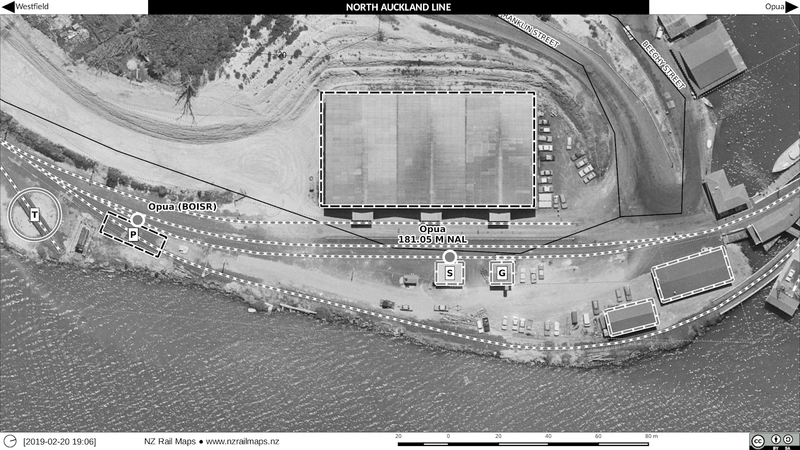 The 2014 photo shows the boatyard now much bigger and squatting on the rail corridor although the tracks are still there. This photo shows where BOIVR have been pushed back to, the outskirts of Opua. BOISR was closed down by LTSA in 2001 for failing to meet their safe certification requirements, as the track had deteriorated by that time significantly over 15 years. BOIVR got going not too long after that, but by but as the big bridge at Taumarere needed major repairs, they got bullied out of the Opua site so they took up the turntable and moved it to Kawakawa in 2006. Then under the Key National Government there were cycleway developments so whoever was the mayor at the time (either Brown or Carter) bullied BOIVR into turning the line beyond Taumarere into a cycleway and the track was buried under a layer of gravel and dirt to let the cycleway go through to Opua. Eventually BOIVR were allowed to put together a proposal for a new station at Opua so this is the site and it will be developed when funding becomes available. With the funding available under Labour/NZ First it seems quite likely they can get Provincial Growth Fund money to make the development happen and the Taumarere bridge has been fully repaired so all they need now is to get rid of the cycleway. However the Whangae Tunnel will need repairs as well so perhaps they will need time to assess the work and extend their funding application there also. 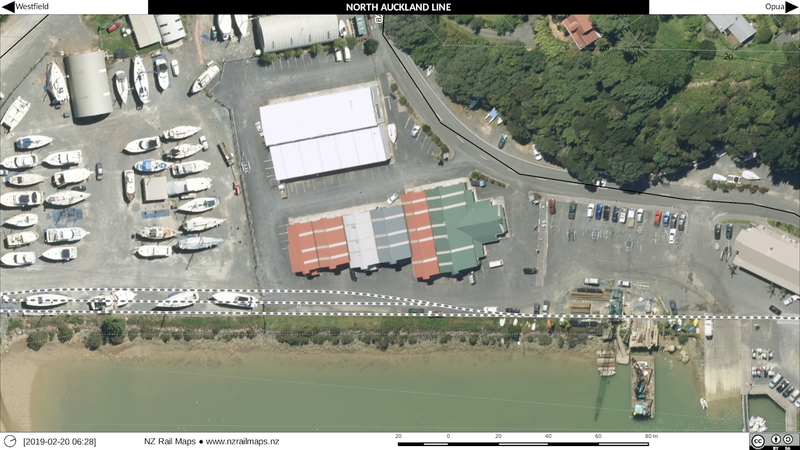 Currently I am getting all the aerial imagery needed for Volume 1 (North Auckland Line). As we know from the history, until 1974 the NAL started at Newmarket and from there ran just over 181 miles to Opua. With metrication and changes in designations, the junction was shifted back to Westfield, but Opua remained the terminus, now almost 300 km away. Most of the aerials were downloaded a couple of weeks ago and I now have to go through them to select the ones needed and overlap the various 0.1m and 0.4m layers into the GIS. 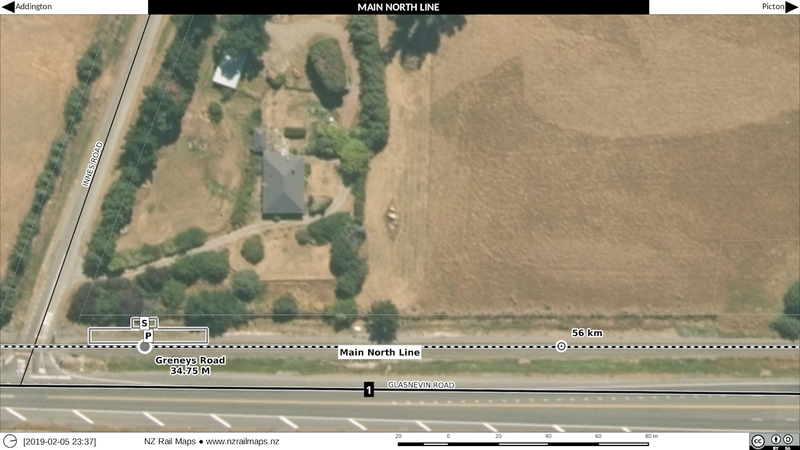 For the start of mapping this line I will be doing the topmost two lines, the Opua-Kawakawa line (Bay of Islands Vintage Railway) and the Okaihau Branch. 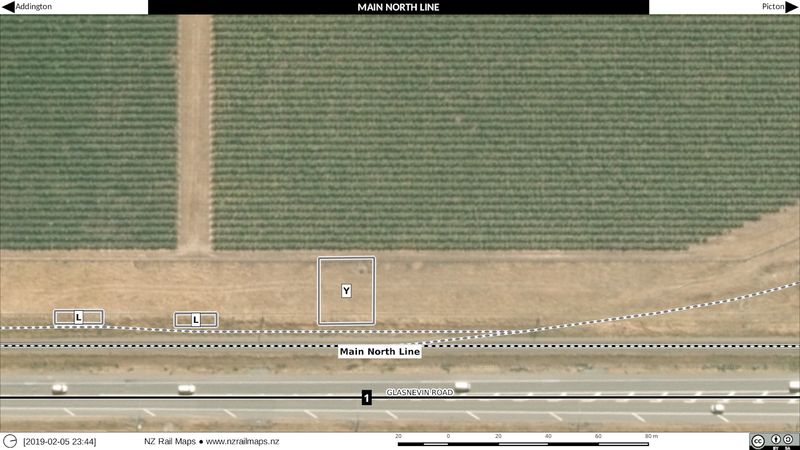 These lines are joined at Otiria, which is currently the terminus of the North Auckland Line. 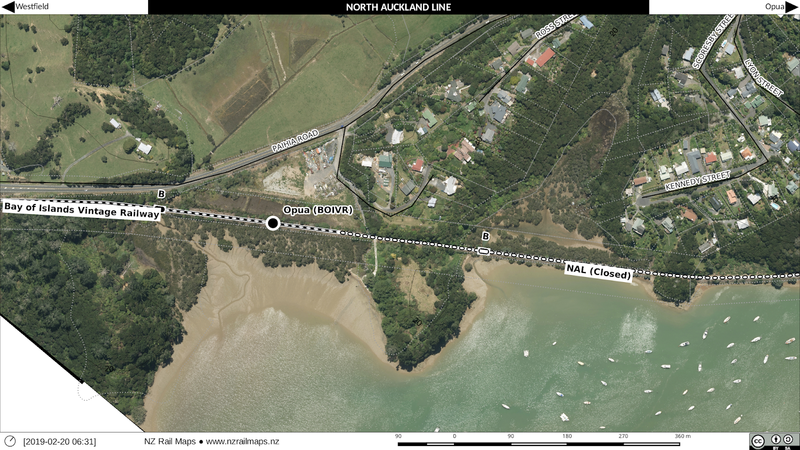 Both sections closed to traffic in the mid 1980s but the BOIVR (initially the Bay of Islands Scenic Railway) took over Opua-Kawakawa and continue to operate it to this day, whilst the Okaihau branch was lifted. The Bay of Islands Scenic Railway had a troubled start and closed down and was re-opened as BOIVR, however the Far North District Council (a National-leaning administration) forced them to hand over the terminus at Opua for a marina construction and therefore it is no longer possible for trains to reach the wharf, the same council also pushed through use of part of the remaining corridor that BOIVR had then mothballed (due to a bridge repair project) to be converted to a cycle way. 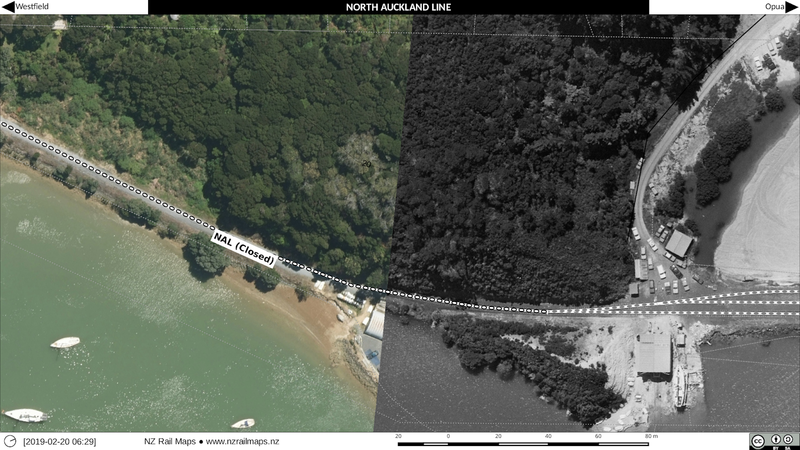 Work is now proceeding on reinstating the rail line to a new terminus just south of Opua. 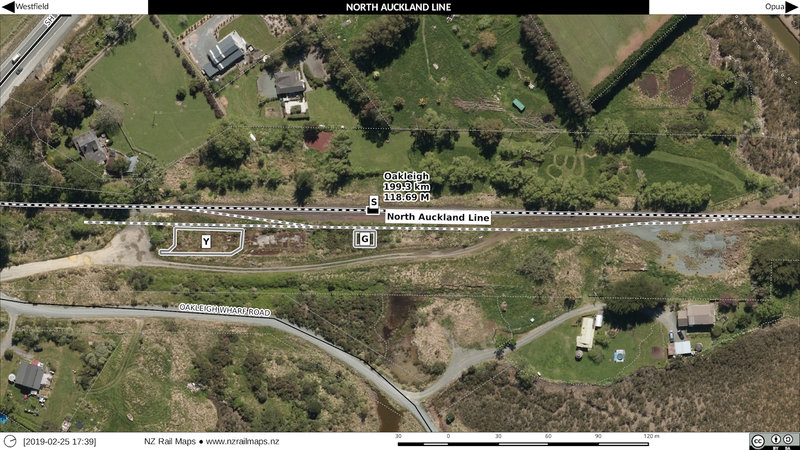 The short section of line from Otiria to Kawakawa was mothballed and then lifted, but may be reinstated in the future. 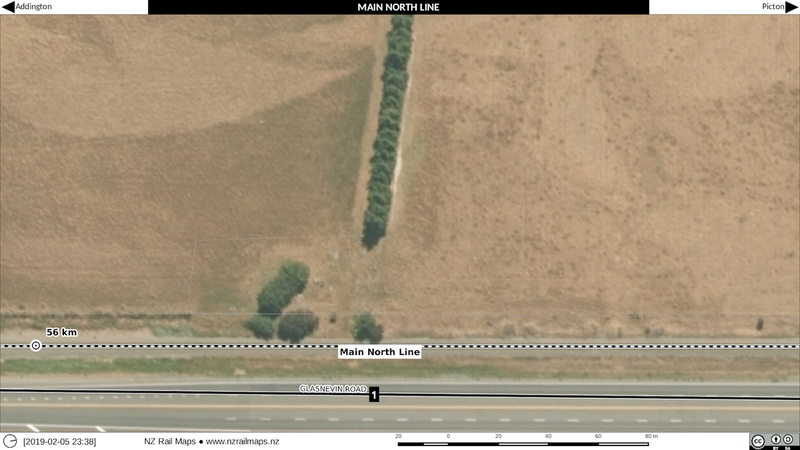 The Okaihau Branch ran from Otiria to Okaihau via Kaikohe. 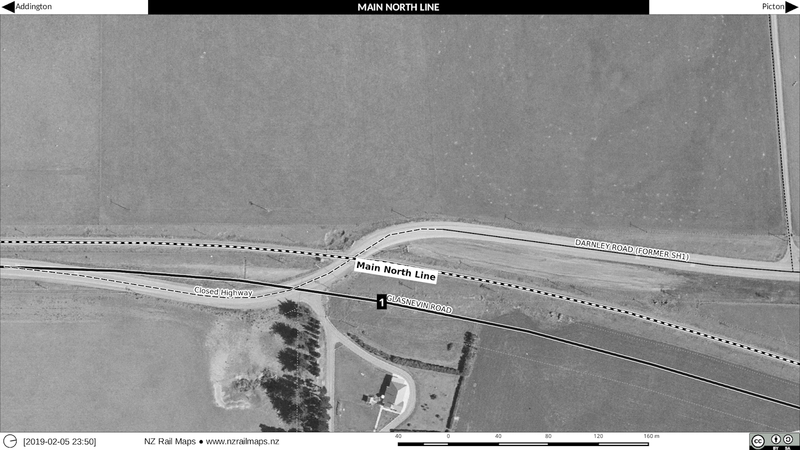 It is the most northern railway line in NZ and was planned to reach Kaitaia. Work beyond Okaihau to Rangiahua continued into the early 1930s, but was closed down by the government in 1936. 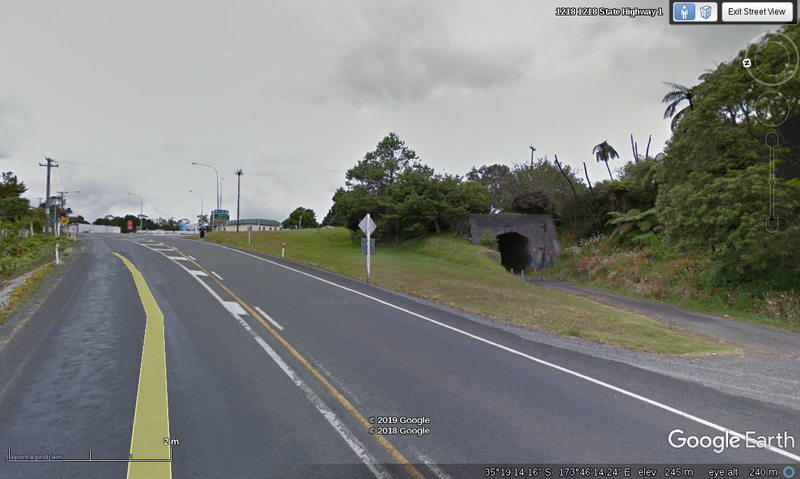 The tunnel under the main street of Okaihau and the former station platform and loading bank at Rangiahua are the most visible signs remaining signs of this work. We have NZR surveys of Okaihau, Kaikohe, Otiria, Moerewa, Kawakawa and Opua and these will be the map mosaics initially developed. Further south there are also NZR surveys of Whangarei (including Kamo and the Port), Portland, Waiotira, Wellsford, Helensville and Waitakere, and non-NZR surveys of Kumeu, Oakleigh and Waimauku. At this stage I don't know what the order is for these, or how many of them will be done in the initial stages. At the moment I am just focusing on getting all the aerial photos from Linz for all the routes and just starting with the top two lines. 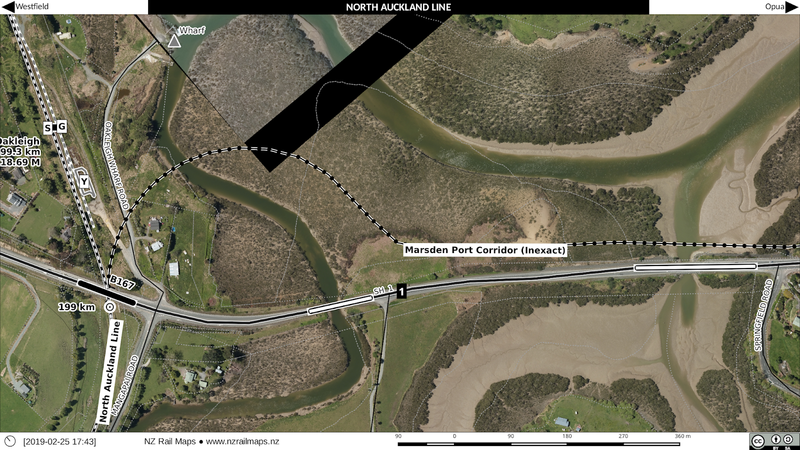 Northland - the Regional Council is too pro-road (being dominated by National Party members) and needs to shift back to supporting rail as they did ten years ago when they did a lot of good work in the early stages of developing the proposal for the Marsden Point branch. Gisborne - has a unitary council which itself was a bad idea back in 1989, but that's another story. The region has suffered from neglect with the National government slashing land transport corridor funding all round. Gisborne local government's transport plan is focused on using their port for log traffic and moving everything else by road hundreds of kilometres to another port (Napier and Tauranga are both about 200 kilometres by road from Gisborne). Apparently about 900,000 tonnes of freight is moved by road in and out of Gisborne every year. This is very self seeking as all they are interested in is the money they can make out of moving logs through the port. The reason for this is they have a monopoly and can therefore jack up the price. No one is going to move the logs to another port by road. Logs are a type of freight that has low margins meaning they have to shift very large volumes of them to make a reasonable amount of money. Apart from the extra cost of shifting freight by road, the two highways north-west and south go through difficult country (as does the railway) and all three have been majorly affected by the unstable geology of the area resulting in substantial cost to keep them operating. 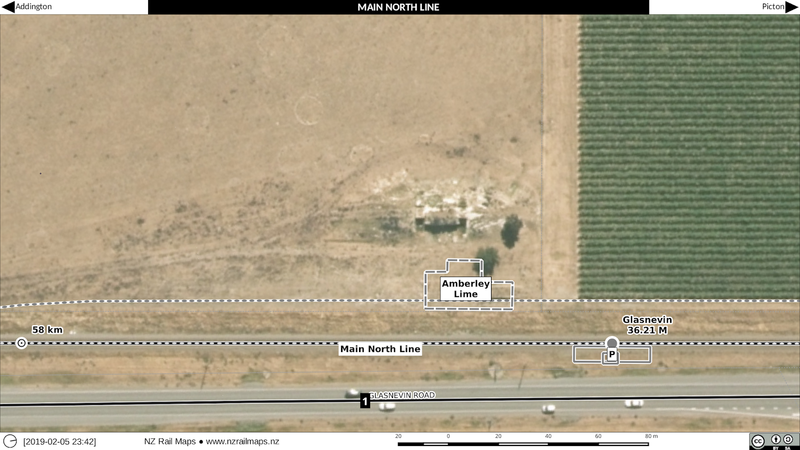 The options for Gisborne therefore are spending money on land transport options whereby if there is the choice of putting large amounts of money into a transport corridor then the railway would be a better choice than the highways but none of these options are cheap and will have ongoing maintenance expenses. They will be difficult to keep open as reliably as the transport corridors south of Wairoa. The other option is coastal shipping which fits well with another part of Labour's transport strategy. It doesn't require large ongoing expenditure like the land transport corridors do. However the idiots in power in Gisborne are focused on going it alone rather than working with another port (either Tauranga or Napier) to move containers by sea. Wellington City Council has welshed on its commitment to a Rapid Transport system. Although this may be addressed by new proposals for light rail. Marlborough - another example of poor governance under a unitary authority structure. MDC is responsible for air pollution from the ferry fleet but has been shirking its responsibilities in this area. This is becoming a concern for people living in the Sounds. Low sulphur fuel should be mandatory for the Cook Strait ferries. The Christchurch City Council is not committed to spending any significant funding on transport infrastructure and has created obstacles to route changes within the city. The Regional Council is returning to a fully elected structure this year and there needs to be the right kind of people elected and especially pro public transport people as there has been poor priority to PT under years of appointed National Party commissioners. As in Christchurch, Dunedin City Council is focused on political objectives over who controls the operation of the bus network rather than providing better services to its residents such as improving roads to enable more stops and better routes. The Government also needs to look at some policy settings. We look set to keep regional council control of public transport services in most regions of NZ which is a good policy. In Wellington the Regional Council (GWRC) is able to own and build rail related infrastructure so the question of why regional councils in other regions such as Canterbury are not funded to build infrastructure is a question as this is usually left to a territorial council to provide and most don't spend more than a token amount. So last year I wrote some posts about Rotorua, specifically the old railway station in the middle of the city. I also wrote I didn't expect to do any more of the ECMT for a while. Well here I am nearly 8 weeks later writing about the ECMT again. This is because at the moment I am working on maps of the Kinleith Branch and Tokoroa. 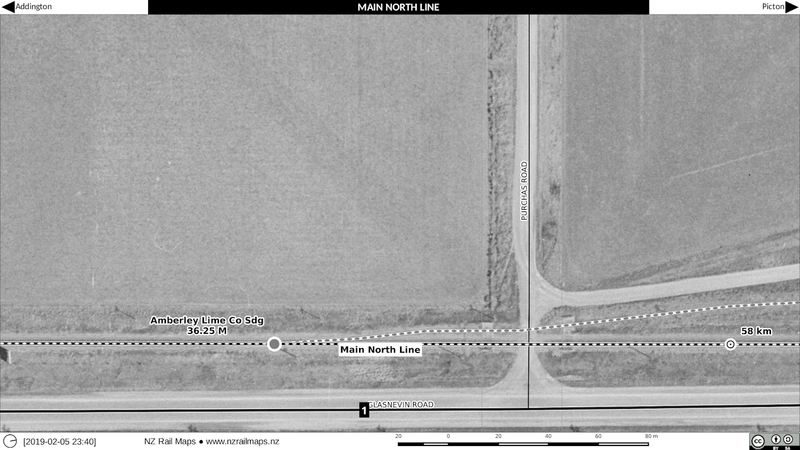 Kinleith Branch is an interesting line with an interesting history. The first part from Morrinsville to Putaruru was originally the Rotorua Branch and opened in the 19th century. Then along came an outfit called the Taupo Totara Timber Co, and they built a bush tramway from Putaruru to Mokai, which is near Lake Taupo. This crossed the Waikato River on an interesting wooden suspension bridge, which was eventually replaced with a steel structure. The idea was that the government might later take over the tramway and convert it into a railway to Taupo. This never actually eventuated as such, but just after World War II, when the TTT was looking to close down its rail operation, the government did buy the full line and they reconstructed the first 30 km of it to become the Kinleith Branch from Putaruru to Kinleith, where a forestry mill was built that operates to this day. Tokoroa became the principal service town for the mill and has developed from a mere siding and industrial plant (not sure what for exactly) in the middle of bare land, into the sprawling metropolis that it is today. 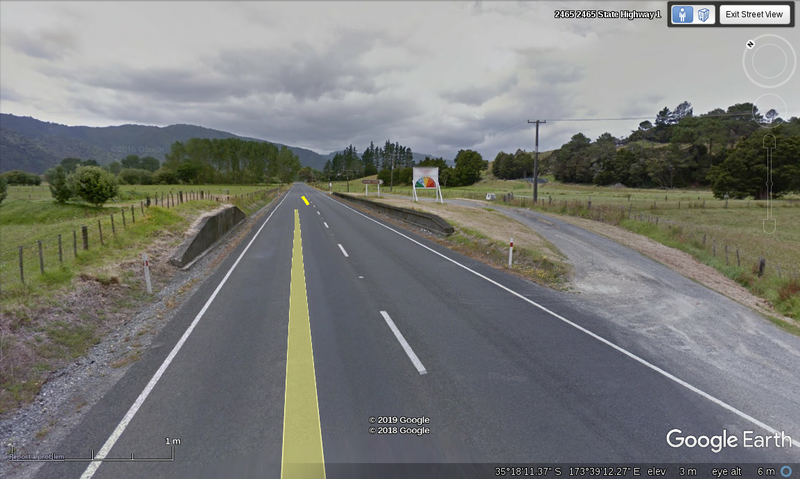 The other 52 km of TTT line was lifted and the bridge over the Waikato, which would have become submerged below the waters of hydro Lake Whakamaru was, we assume, dismantled. Fast forward a little and with the opening of the East Coast Main Trunk itself to Taneatua in 1928, the inadequacis of the main line route via the Karangahake Gorge became apparent and pressure developed for an improved route to increase capacity. Thus the Kaimai Deviation was born and took shape in the 1970s. 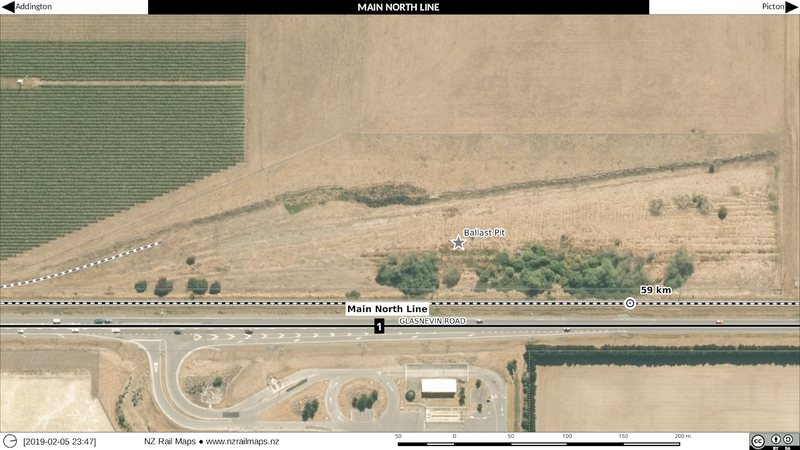 The new route, opened in 1978, joined the Rotorua Branch at Waharoa, resulting in the first part of the Branch becoming the main line, and at the same time, the Branch section from Waharoa to Putaruru was reincorporated into the Kinleith Branch, now 65 km in length. The Rotorua Branch origin was thus relocated to Putaruru and its length was reduced to 50 km. What we know today is that the Kinleigh Branch over its last 30 km can be mapped against the TT Co route because full aerial photos were taken in 1944 of this first part of the route. This means I can use this coverage to be able to draw in where the line was deviated when it was adapted into a railway, and publish maps showing the old route. Unfortunately there are considerable gaps in TTT coverage south of Kinleith but parts can still be seen on some older aerial photos, and this will be incorporated into these maps wherever possible. This is a more in depth look at what we hope to see developed in the Project in 2019. Volume 1: Selected stations in the Far North. Volume 2: Auckland Central, Te Rapa/Hamilton, and the parts of Wellington already covered. No other plans at this stage, partly because of lack of Retrolens coverage of the Central North Island. Volume 3: Selected stations on the Kinleith, Taneatua and Thames branches, and on the closed section between Paeroa and Apata. Volume 4: No comprehensive development planned due to lack of Retrolens coverage in the area. Volume 5: All stations between Napier and Gisborne, and selected stations in other parts of Hawkes Bay. Limited by lack of Retrolens coverage south of Ormondville. 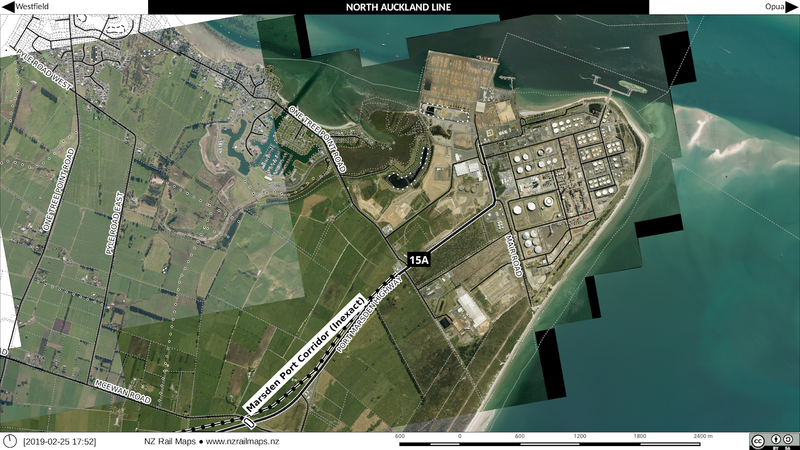 Volume 6: Some areas of the Wairarapa already completed, which may be added to. Limited by lack of Manawatu coverage of Retrolens. Volume 7: Some stations on the Nelson Section. Volume 8: No comprehensive development planned due to lack of Retrolens coverage in the West Coast. Volume 9: Comprehensive coverage of Otira, Arthurs Pass and selected stations on the Canterbury side. West Coast is limited by lack of Retrolens coverage. Volume 10: Selected stations within Christchurch, North Canterbury, Waiau Branch, Picton and Marlborough. Volume 12: All stations on the Otago Central Branch. Selected stations on the Kingston Branch and its branches. That is a lot of work but I have left myself plenty of wriggle room by using the discretionary term "selected" to avoid getting too committed to particular locations. Because work is going on in a number of different areas all at once, in addition to the regular diet of posts about specific stations or sections, a weekly progress report will also be written. Glasnevin was the station on the Main North Line that was located between Greneys Road and Waipara. Apart from the platform and building or shelter, there was a separate siding for the Amberley Lime Co and and for the ballast pit just north of the station. 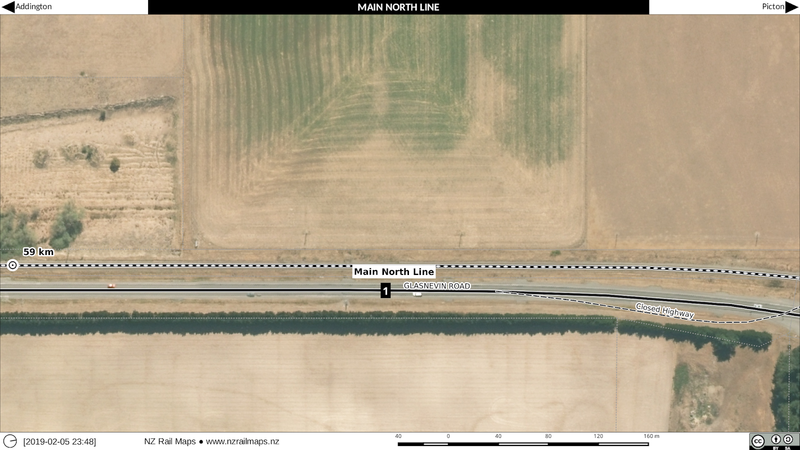 Just north of the pit, the highway used to cross over the railway line and go down to an old wooden single lane bridge across the Waipara River, upstream from the railway bridge. This was replaced with the present two lane concrete bridge about 1971/72. Like Greneys Road, Glasnevin was closed to the public in 1966. 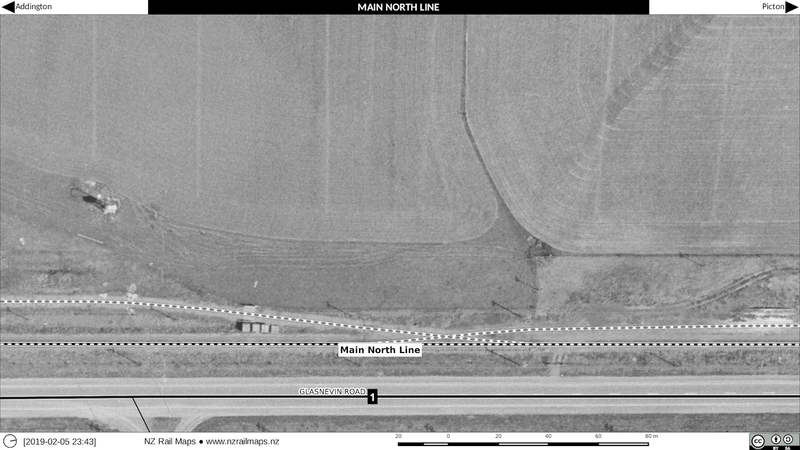 The date of the lime siding being closed is unknown to me at present, and when the ballast pit ceased to be used or the track, which is clearly visible on the aerial photo, was lifted, is also unknown. The lime siding consisted of a facility for receiving lime loads from vehicles, which dumped into a pair of hoppers, from which it appears conveyors took the lime into a building or shelter under or in which rail wagons were loaded. The truck dumping facility with its two hoppers, made of concrete, is the part which can still be seen beside the railway track to this very day, the rail loading structure having been removed. The ballast pit remains clearly visible as it has not been filled in to any significant extent. 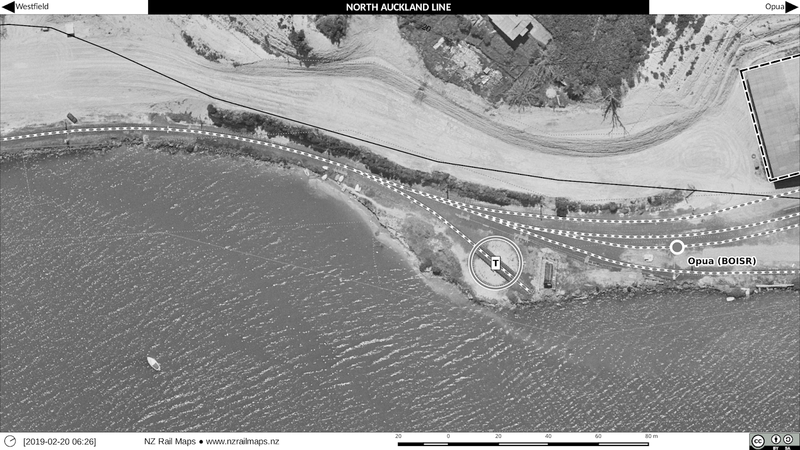 Lime loading facility remains seen in 2008 from the Coastal Pacific. Glasnevin ballast pit which for many years was bare gravel but has in more recent times been dressed with soil and sown in pasture. Greneys Road was the first station north of Amberley on the Main North Line. 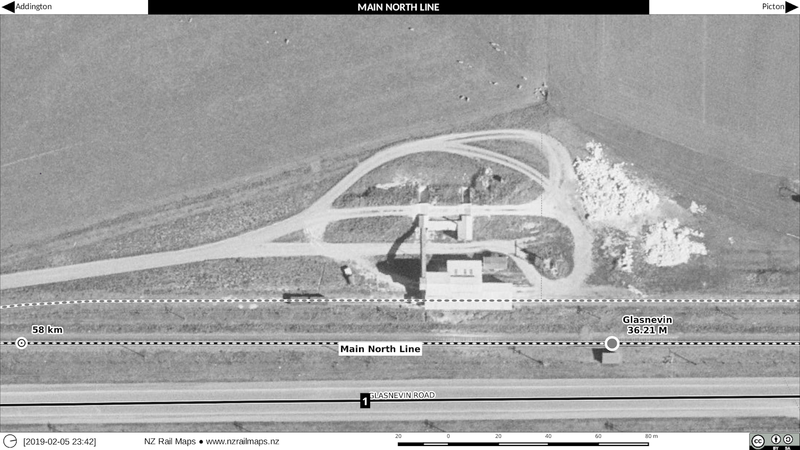 It is shown here in 1961, by which time it apparently consisted of merely a platform and small building or shelter. With 2013 for comparison. 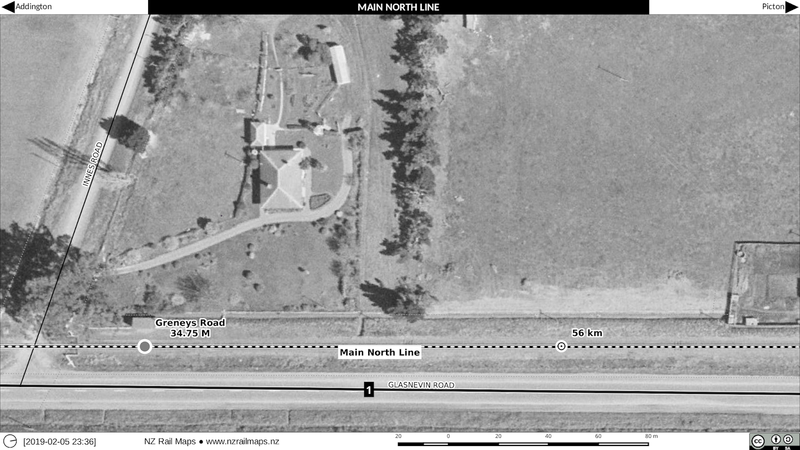 The house immediately north of the station, with no apparent road access, may well have been a railway staff house. 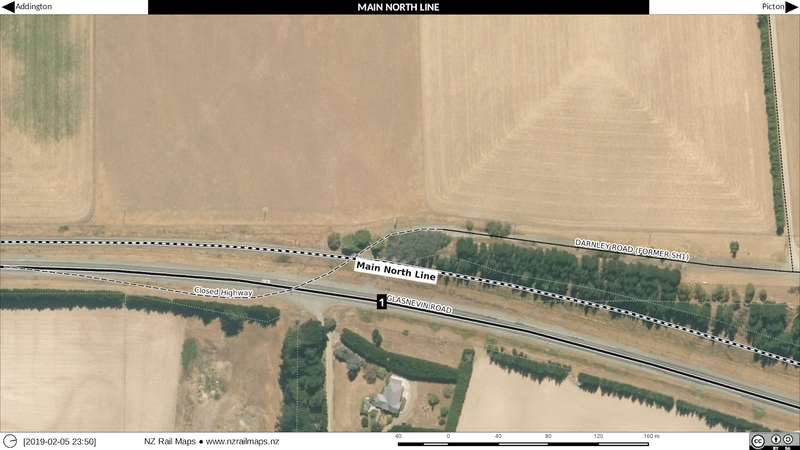 As part of the development work on various volumes, I am currently working to get a full set of maps of the Main North Line and mapping a few stations in North Canterbury. 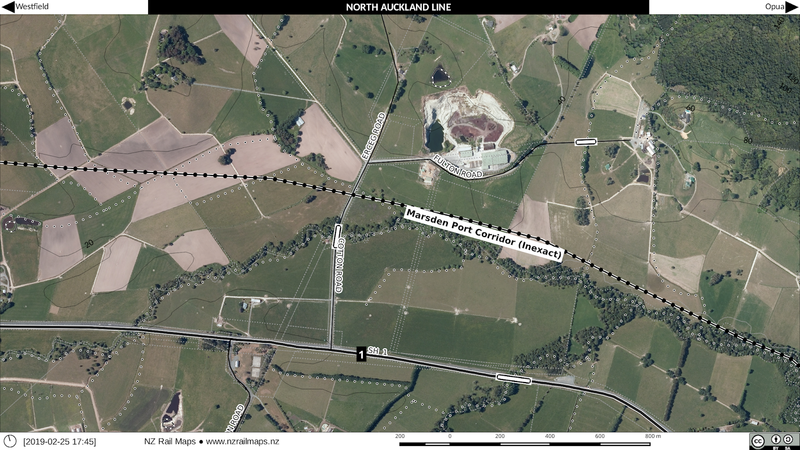 You can expect to see some maps soon of Amberley, Glasnevin, Waipara, Culverden and possibly some stations on the Waiau Branch, and places further north and south of Waipara, as opportunity permits. So I have to get a full set of contemporary aerial photography. The tricky area is from Addington to Waipara, where I have to join together images from four different source layers. Firstly there is the 0.075 metre coverage of Christchurch City all the way up to the Waimakariri River. Then after that there is 0.3 metre rural coverage of North Canterbury, but also with Waimakariri District urban coverage of Kaiapoi and Rangiora at 0.075 metres, and Hurunui District urban coverage of Amberley and Waipara at 0.125 metres. And of course to add complexity the powers that be have created aerial tiles that have thick black borders in inconvenient places around the edges, which means I have to make up bridge tiles by bringing in the lower res surrounding stuff and scaling it to a larger size and then masking out the black bits. Since these areas are generally around railway stations, the mosaic for removing the black edges will be combined with historical overlays. 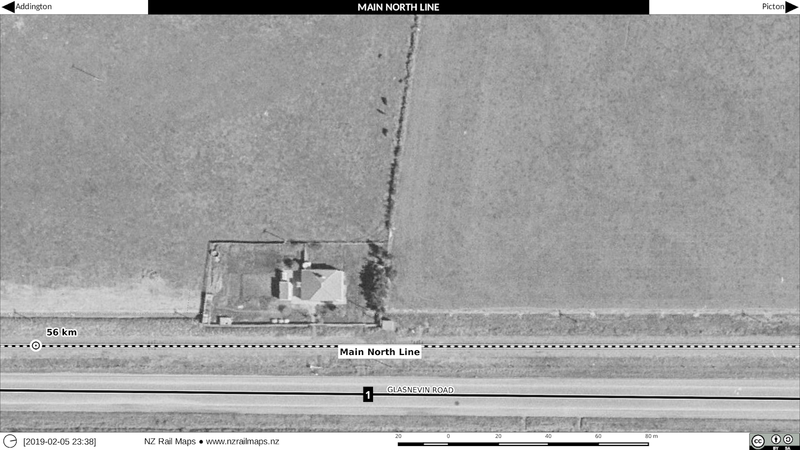 Because I have discovered the 0.125 metre coverage of Waipara, I am redoing the mosaic that I already had for this station to take advantage of the better resolution which will improve the official NZR survey historical aerials, just like I have done in other areas. 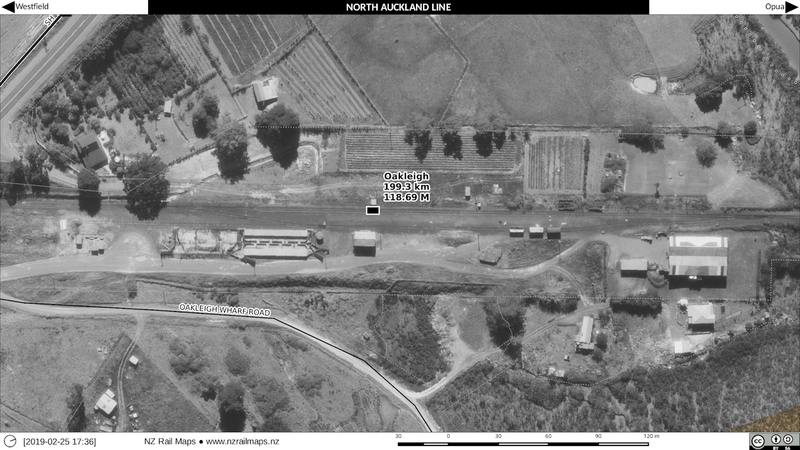 0.125 metre coverage of Waipara in a GIMP project with 0.3 metre imagery added top and bottom to remove the most critical black edges. The 0.125 metre tiles will be exported and used as base imagery in place of the ones from Linz. I have created a mosaic for Amberley with the 0.125 metre imagery and overlaying historical aerial images from 1961, 1976 and 1986. 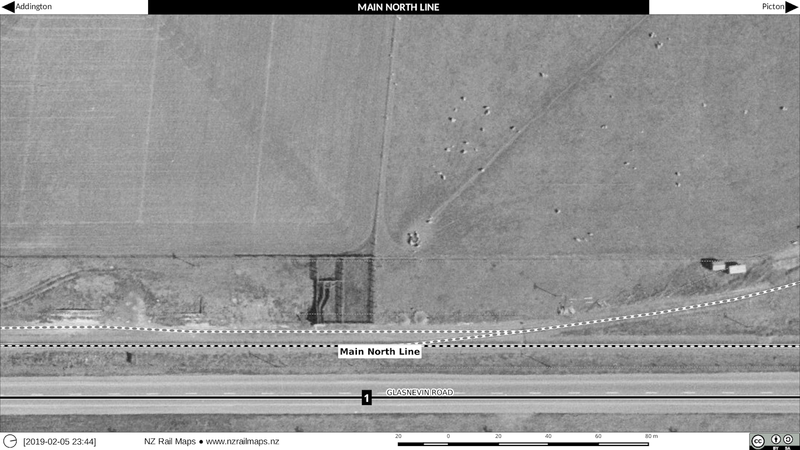 It now needs to have the 0.3 metre contemporary imagery put around the edges of the 0.125 metre images to achieve the same outcome as shown above for Waipara. Amberley seen in 1961 with the earlier (and larger) station and goods shed. By the time I came to know Amberley in the mid-1980s both buildings had been replaced with much smaller ones. 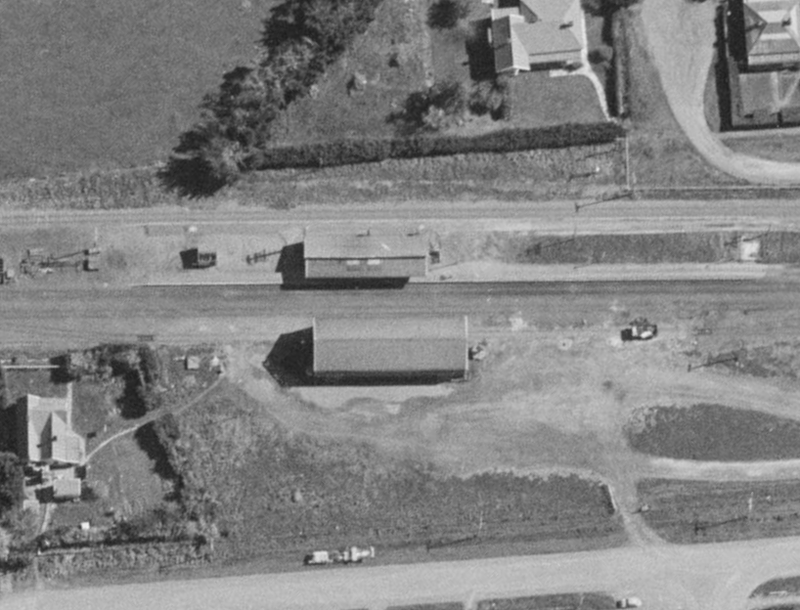 Glasnevin is another station of interest between Amberley and Waipara as it was still open in 1961 when aerial photos from the same series used for the above are available (as was Greneys Road just south of Glasnevin). There was a lime loading siding and ballast pit there which were still in use at that time. The remains of both are extant today. The Waiau Branch has been looked at lately as well and Culverden in particular has good quality coverage and maps have been drawn and are just waiting to be blogged. Of course I posted stuff for Rotherham fairly recently. We will have to see what we can achieve with some of the other stations that have limited coverage. 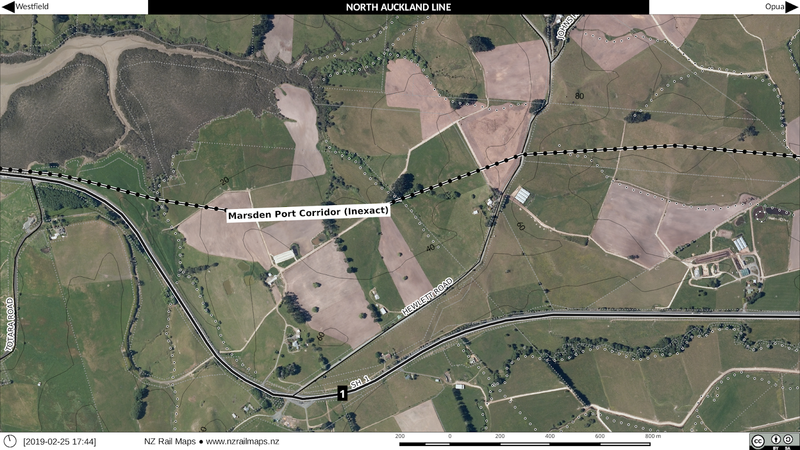 Hundalee is another North Canterbury station I have mapped recently. Once north of Waipara the same 0.3 metre rural aerial photos are needed to get us as far as Parnassus. From there all the way up to Ward we have continuous good quality aerial imagery from the recent quakes but with obvious issues with track movement in places so I am not sure if it will be totally useful or whether I need to use the existing coverage as a backup. Then from there, is Marlborough rural aerial stuff, and I hope there will also be coverage at higher resolutions for places like Picton, Blenheim and Kaikoura. In accordance with the intention to develop all volumes this year, I am starting work on creating Volumes 1 and 2 today. Volume 1 covers the North Auckland Line and its branches, which is everything past Newmarket in Auckland. This means basically all the railways in Northland. Volume 2 is the North Island Main Trunk, which is from Wellington to Auckland. This includes the railways in Wellington, Palmerston North, Hamilton, Auckland and a number of other centres. The NIMT part is needed to finish Volume 4 where the SOL joins onto the NIMT. 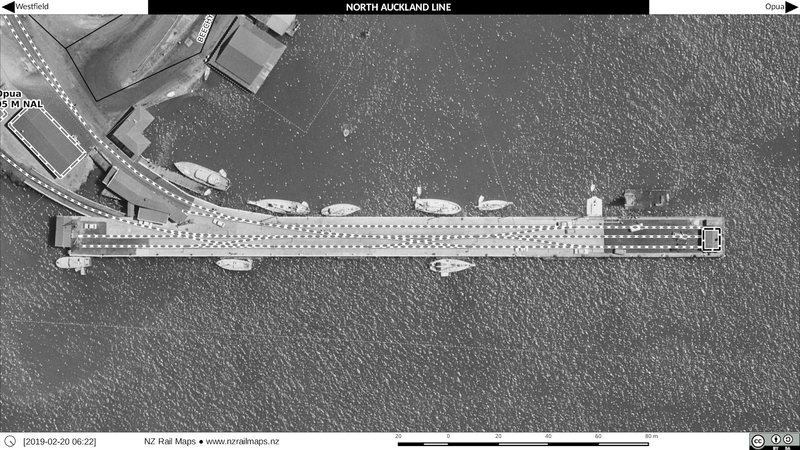 I am currently downloading Auckland City aerial photography from 2017 at 0.075 metre resolution. This will take around 40 GB of downloaded imagery but the amount actually needed to cover the rail network of Auckland will be considerably less. At this resolution it is only for modern coverage. Anything that is an aerial mosaic should use the separately downloaded older 0.125 resolution coverage to reduce the number of tiles needed to cover a station area. However no mosaics are planned but I may do one of Auckland's Strand station sometime soon, especially if there is official NZR survey coverage for it. Likewise I may do one of Frankton and/or Te Rapa. I have already done a number of Wellington so these can be added in to the Volume 2 stuff. PN is not possible as no Retrolens images have yet been released for Horizons RC. The rest of the NIMT will undoubtedly be lower resolution probably 0.3 to 0.4 metres. Although Volume 2 was created last year I have only done a bit of Wellington so far. 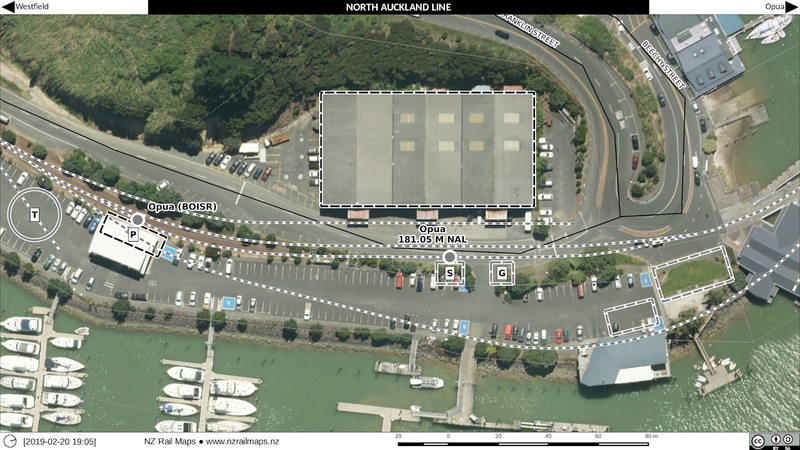 It would have been interesting to have had georeferenced aerial photography of Auckland from mid 2000s for comparison of the double tracking and other improvements but that isn't possible unfortunately. Northland coverage comes to 0.4 metres dated 2014-16 for the whole region as well as some 0.1 metres of a few small areas. The 0.4 stuff will be adequate but does not really have the sharpness needed for tracing the current rail lines. It's a pity they do not have 0.3 metres but I guess that is the reality of a less populated area. The 0.1 stuff should cover Whangarei and one or two other urban areas well enough.